I am headed back to Minnesota for a visit in May, and I am looking forward to seeing my family and friends, and spending some quality time with them. And besides those lovely souls I am planning to spend time with, I am thoroughly looking forward to some dog time! 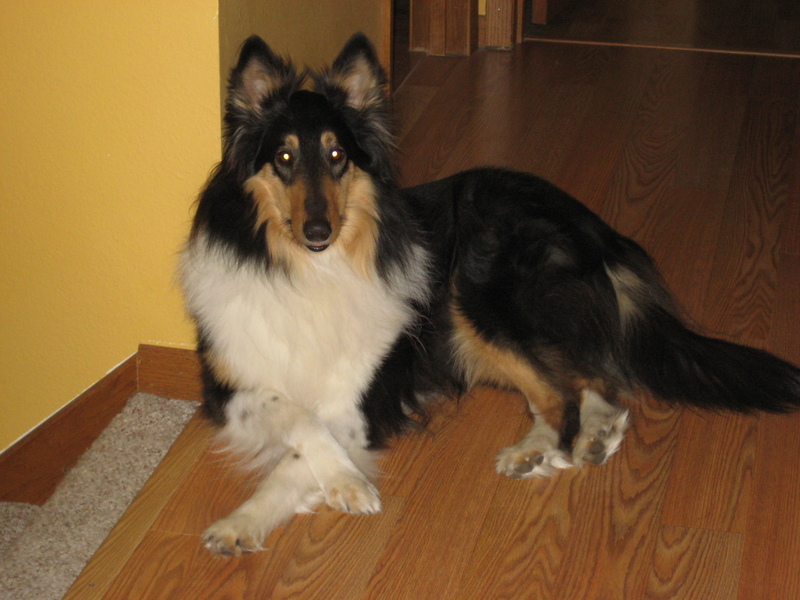 I will most certainly be seeing my daughter and son-in-law’s two dogs, Chopper and Boe Boe, as well as my son’s dog, named Buster, and I am making sure to pencil in time to see “my girl”, my collie named Maddie who I had to leave behind with my ex-husband when I moved to Portland. 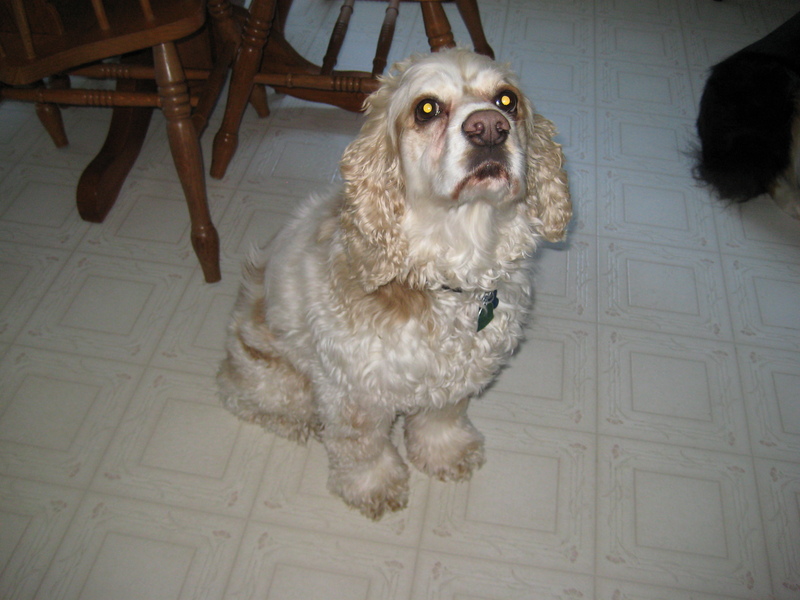 And sadly, I will also be sure to visit the grave site of my other dog, Kirby the lovable cocker spaniel, who recently passed away after a happy and fulfilled dog life of twelve years. When I went back for a Christmas visit in December of 2011, I stayed at my daughter and future son-in-law’s home for most of that time. So I got to know Chopper and Boe Boe quite well, and was inspired by their day to day antics enough to write a poem about each of them. Boe Boe is the elder one of the dog household; he is a mellow mutt who had the run of the place until the little guy came around. 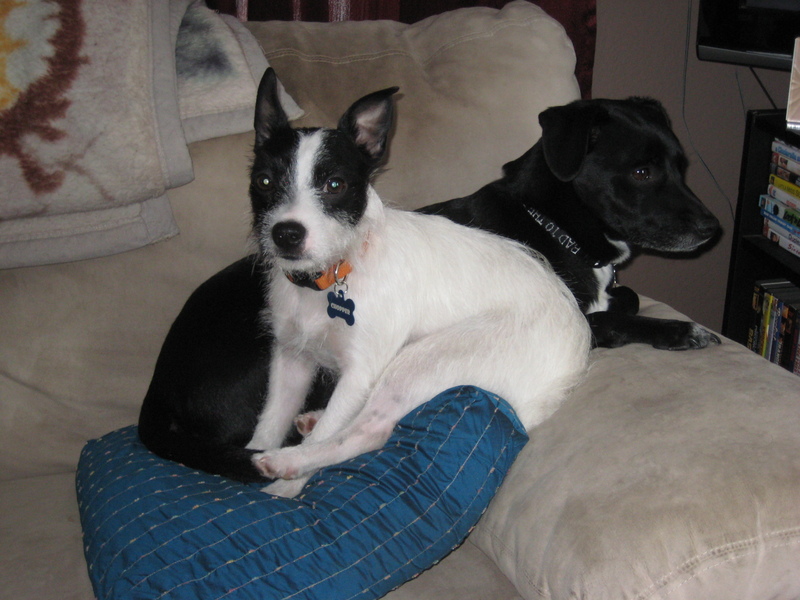 And Chopper, with his boundless Jack Russell terrier energy is about as different from Boe Boe as night from day. But they have learned to love each other, with Boe Boe accepting Chopper into the family, and helping to breathe maybe a bit more life into the old boy. Those of us who are blessed to experience the love of a pet, be it dog or cat or even a goldfish, know of the special bond that ensues from such a relationship. I look forward to having some very special dog time when I go for my visit in May; as I once more get to experience some unconditional love in the way that only our pets can bring. I am nimble – a jumper of great heights! Because sometimes they lock the door! Or is it in my head? Until 5 a.m. – at the very latest! My newly married daughter is already a widow; a hunting widow that is. Her beloved is deep in the throes of hunting season, leaving her alone on recent weekends to traipse after the ever elusive deer with his trusty bow and arrows in hand. 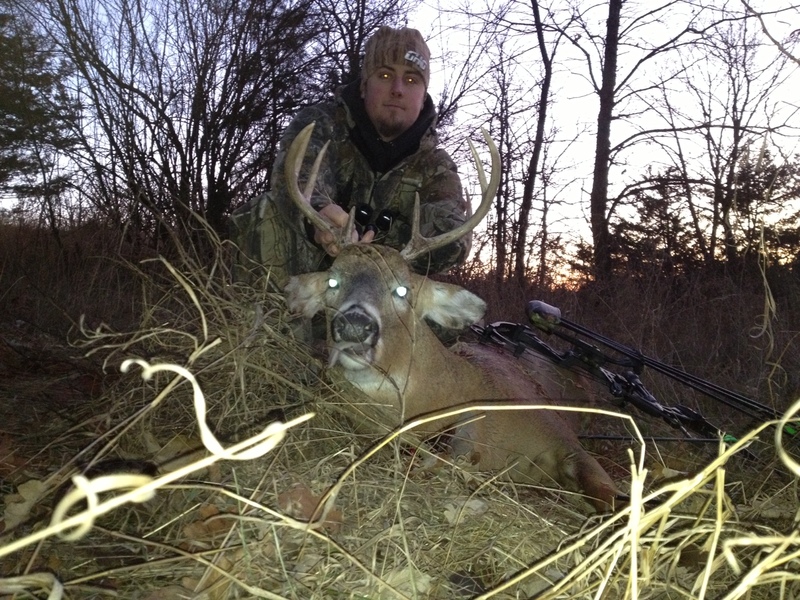 And the beauty of hunting with a bow rather than a gun is the extended season offered to the bow hunters. They can keep trying and trying long after the regular deer season has come and gone. And try and try he did, coming home an unhappy hunter in his first few attempts, with no trophy to show for his efforts. That is until last weekend, when he shot an eight point buck (the number having to do with the size of Bambi’s antlers) and he finally comes back home a happy hunter. But fear not, hunting season does not end just because of a successful hunt. No, my son-in-law is leaving right after Thanksgiving dinner to try for more; afflicted with the hunting fever. And all this talk about hunting and deer brought back the memory of my first deer; that is, the first (and thankfully only) deer I ever hit with my car. I was so unprepared, as I drove home one night after aerobics class, oblivious to the suburban deer that decided to cross the road right in front of my car. And unlike my happy hunter son-in-law, I did not celebrate my first kill. Instead I felt sick inside – I had taken down one of God’s beautiful creatures, and a baby at that! Oh, the horror! Luckily for me, my big boat of a 1977 Impala just ran right over the poor creature, sustaining not a lick of damage except for the deer hide underneath my car that smelled worse and worse as I drove home. After I got home I called the police to tell them what happened, said a prayer so I would be forgiven, and swore that I would always scan the sides of the nighttime road with my “deer eyes”. But as the years went by, I found that the best laid plans sometimes falter, and I had a few other run-ins with my car vs. nature. There was the goose I hit as it tried to cross the highway with what I’m assuming was its mate; I just wanted to pull the car over and cry. And to add insult to injury, after I got to work and told a co-worker about what happened with the goose, she proceeded to tell me that geese mate for life. Now all I could think about was the widowed goose, the poor little goslings I left without a mother or father, and how I managed to tear a lovely goose family apart. Then there was the raccoon I almost managed to avoid. I swerved to avoid him on the two lane road in the way that they always tell you not to, but it was late and there was only me on the road at the time. But this poor guy must have been old and he was a bit overweight, even for raccoon standards, and his last minute decision to try and make it across landed him right into my front bumper. And unlike my old Impala, my newer Honda Civic didn’t do so well, and pieces of plastic went flying down the road along with the now very dead raccoon. But by far the worst roadkill for me was when I hit a hawk. Yes, I hit a hawk that was sitting on the road in the middle of the night eating roadkill. What the hell was he doing there, eating food that was usually left for the crows to pick up, and what happened to his super sharp reflexes that should have had him flying away at the last second, like the crows always did? Maybe he had eaten some tainted meat and was brain addled, but I’ll never know because I killed him! And this really broke my heart, as I have a strong affinity for the raptors. I love to watch them soar in the sky, riding the unseen currents of air. I would always seemed to spot them when I was out walking or even driving, as if we had some sort of connection. And now, I had destroyed one, never to soar again. I only hope that all those poor creatures I inadvertently killed with my innocent car can forgive me, as they reside in animal Heaven now, safe and sound from the perils of the roadways. And I am happy to be car-free now, no longer driving a weapon of destruction against nature. My hunting season has now ended. I’ll never understand why it seems to be human nature to find it easier to complain than to praise. Maybe that’s a bit of a poor generalization, maybe it’s just the crabby old person starting to come out in me. But you’ll have to agree that most of us are quick to jump all over a person or place that has dissatisfied us, yet we keep to ourselves any positive experiences we have. This best shows itself in the increasing multitude of lawsuits being filed over any little thing, and the fact that malpractice insurance costs for physicians are starting to scare prospective medical students away. So I try to retrain myself, to get out of the Pavlovian response of only letting my dissatisfaction show. Now I try to think of instances where I could share a kind word or two about something or someone who has made my day. After my trip to Chicago in 2009, I came home, remembering how enjoyable the whole experience was; from the person at the hotel who helped me when I needed a cab, to the friendly and informative people manning the Hop On, Hop Off trolley that took me all around town. So I sent words of thanks to these places and others, telling them what a great job they did. It felt good to share some joy, and I could almost feel the happiness in the recipients of my messages. Positive energy all around; much healthier than the other side of the coin. And I must have rubbed this off on my daughter in some way, as she related to me a story about going on a frustrating search for just the right pair of jeans. Now granted, my daughter has literally a multitude of jeans in her closet, and her husband must have been shaking his head (lovingly, of course) as she set out to find a new pair or two for their upcoming honeymoon. She told me how she wandered through the mall, going to store after store, looking for flared leg jeans and not the skinny leg jeans that are so prevalent. Finally, at the last store she checked, there they were – tables and racks full of jeans with the perfect flared leg – she told me was a madwoman as she filled the fitting room with a mountain of jeans. Out of all this craziness she managed to find two pair that met her stringent guidelines. She went home a happy fashionista. She told me that after she came home, full of the joy of a very successful shopping expedition, she was moved to write an e-mail to the company that saved her from a fashion meltdown. In doing this she hoped that the company will know how satisfying it was to have just what she was looking for, and how helpful the employees were. Of course there are times when we need to go down the other road, to voice our complaints or to make known our unhappiness so that others may be spared. But let’s not forget how easy it is to go down the path of saying “wow, thanks for doing such a great job and making me happy”. It takes the same amount of energy to write words of praise as it does words of complaint, and I’d rather see more of that positive energy floating around in our world. It’s been awhile since I’ve had a travel adventure; I would say the last place I really traveled to was Portland, last year when I moved here. And now I am happily settled in as a Portlander, and I have had adventures and explorations around my pretty city. But I could feel my soul, nudging me on a bit as I hemmed and hawed about attending an event in Seattle, about angels and the afterlife. Oh my, two topics so near and dear to my soul, and a chance to go on an out of town adventure – well, why not? So I purchased a ticket to the event itself, a round trip train ticket from Portland to Seattle, and made reservations at a hostel for two nights – that in itself would be a whole new experience! But after finding hotels in downtown Seattle averaging around $200 a night, I took a leap of faith in the $69 a night hostel experience – after all, I am an adventuress! The four hour train ride to Seattle was very pleasant, and after sinking into a good book I brought with, I was there before I knew it. I love traveling by train, and Amtrak once again proved to be a mode of travel I am very comfortable with. My skills in acting as my own travel agent proved to be quite proficient, as I found myself situated only five blocks from the hostel I had found, and less than five minutes by city bus to the convention center where the angels & afterlife event was being held. I had to pat myself on the back for that bit of perfect planning! I do have to admit though, that as I walked through the heart of Seattle’s Chinatown to get to my hostel, I was a bit nervous. There is a Chinatown in Portland that I have walked through many times, and it just doesn’t seem quite as “gritty” as the Chinatown in Seattle. But I do have street smarts, that tell me to be back at the hostel before dark, and to try and not look like a tourist – in other words, only look at the big bright fold-out map of Seattle before heading into a “questionable” area. 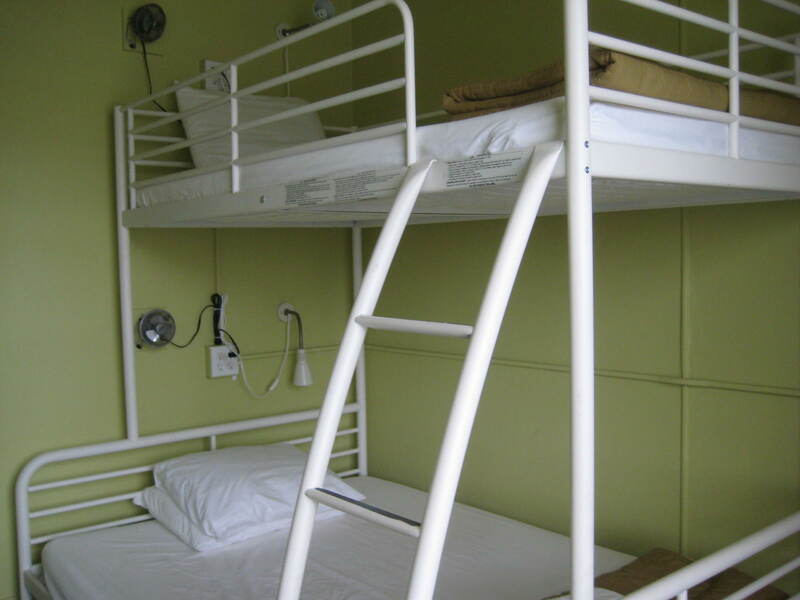 The hostel itself was warm and welcoming, and the staff very friendly and helpful. I had to laugh though when I saw my room. I don’t think I quite understood the whole hostel experience, as I just thought it would be like having a very basic hotel room. Imagine my surprise when I opened the door to my room (and I had booked a private room) and saw basically, a college dorm room – a metal frame bunk bed, a sink, and a tiny wooden table in the corner. But you know what, it was all I needed, and the whole time I was there I felt completely safe and comfortable. What a deal for only $69 a night – and I got breakfast to boot! Time to explore Seattle! 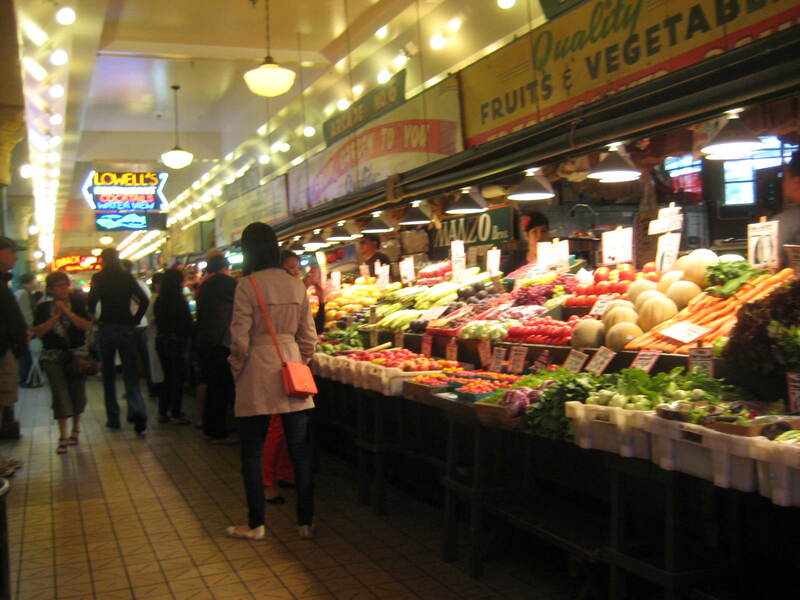 I didn’t plan on going too far, but I had enough time to make my way to the waterfront and to a place called Pike Place Market. 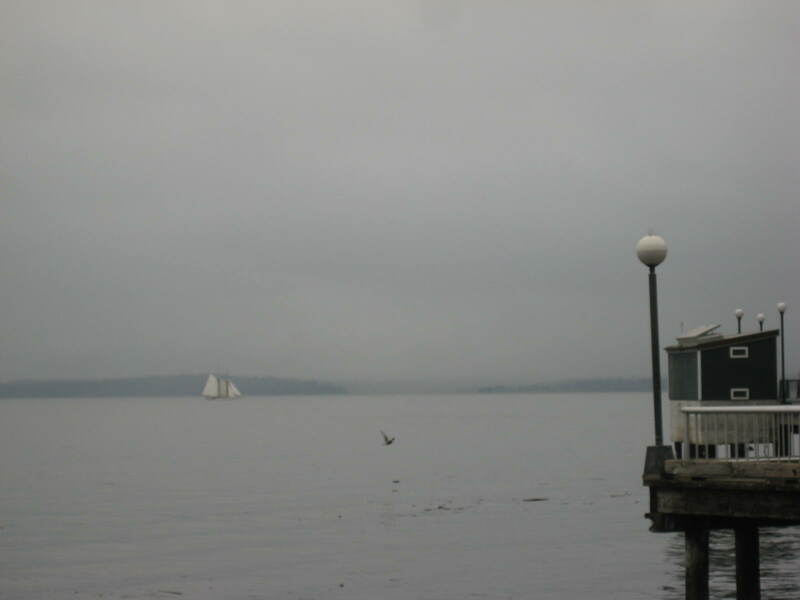 The waterfront area was pretty, looking out over an expanse of water called Elliott Bay. 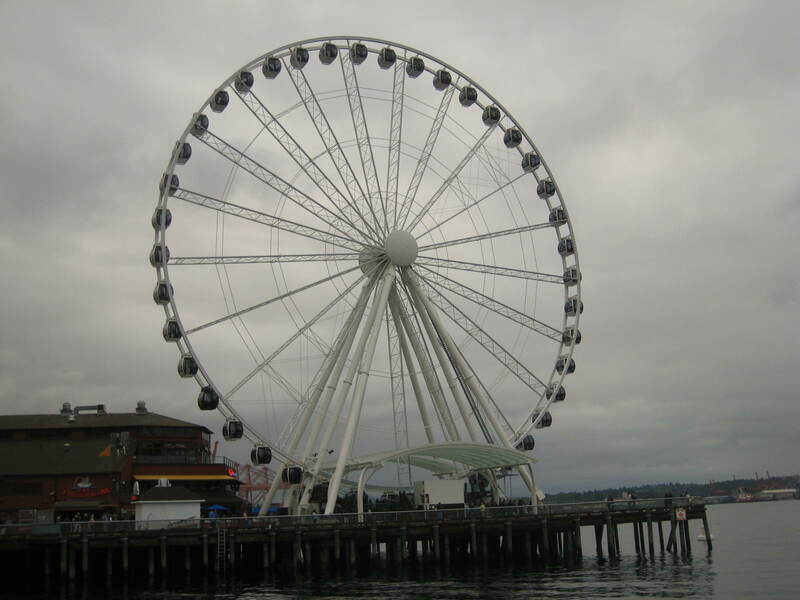 I spotted the huge Ferris Wheel from a ways back, so tempted to take a ride and see everything from high in the sky. But when I found out it would cost $15, my budget minded self thought it may be better spent elsewhere, like on food. 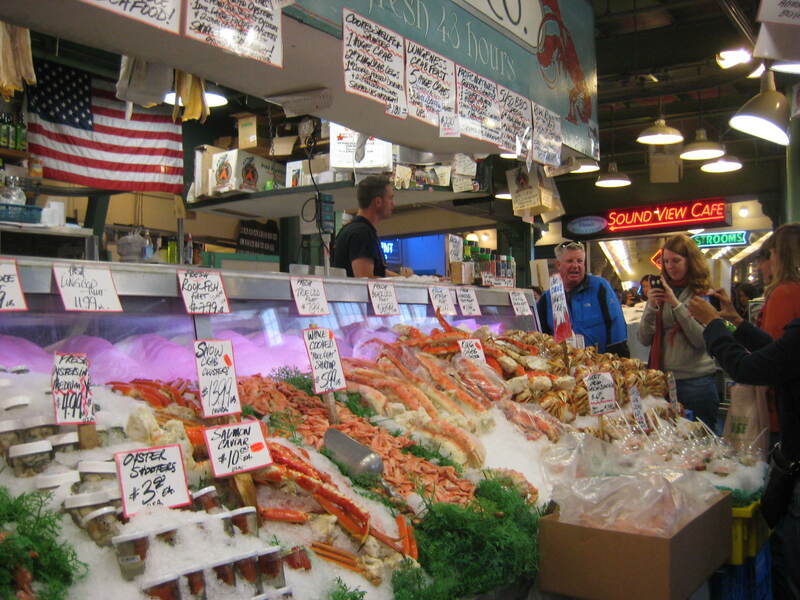 And Pike Place Market had plenty of that – from fruits and vegetables, to chocolate and cheese, and of course the amazing array of seafood that Seattle is so known for. The fish vendors are half the fun in the marketplace, as they toss fish back and forth, making up crazy rhymes and chants as they go along. I settled on some great bread and delectable cheese, going a bit European, with a cheesecake truffle for dessert – perfect! The next day was my biggest concern, as I needed to navigate the free downtown bus system to get me to the convention center. This free bus ride takes place in what is called the “bus tunnel”, and it is just that – a tunnel, much like a subway, that has both buses and transit trains running through it. But thanks to a helpful employee I found in Union Station, I was able to get on the right bus and get there easily, as well as getting back – phew! That was honestly my biggest concern about the whole weekend, and I conquered it. The event itself, the catalyst for getting me to visit Seattle in the first place, was very nice. The speakers were John Holland, a well known medium/psychic, and Doreen Virtue, a woman who connects with the angelic realm and is equally well known in the metaphysical world. I didn’t really come away with anything I hadn’t already heard or knew, but the energy was lovely, and the speakers were very interesting. I was able to walk around the downtown proper during the lunch break, and it seemed very nice – but not as nice as Portland! 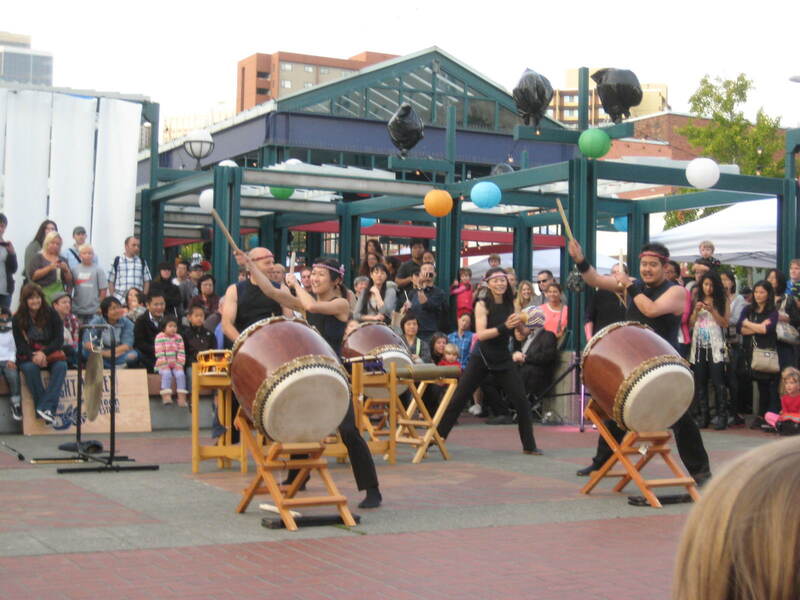 When I got back to the hostel, I found a celebration going on in Chinatown – the Moon Festival. What luck for me to be staying in that part of the city during this festival, and I was able to satisfy my craving I had for weeks for sweet and sour chicken – it was delicious! 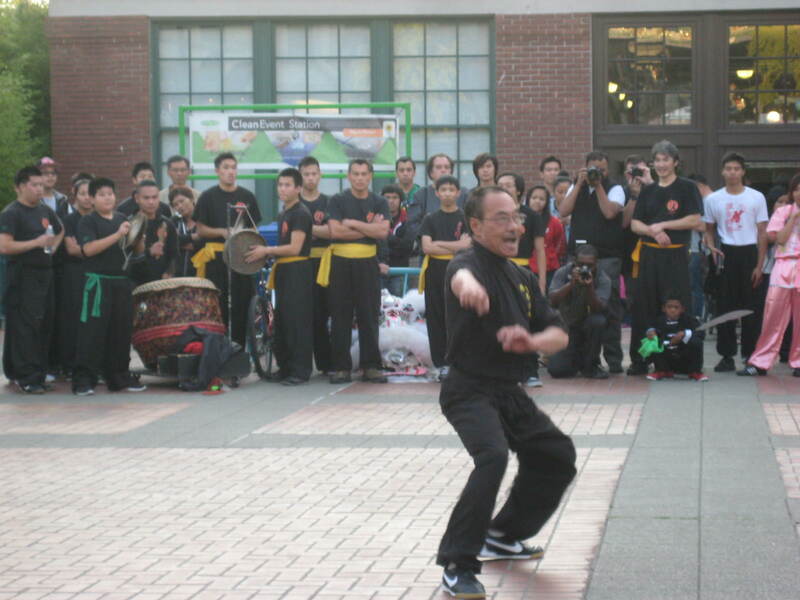 I watched some displays of martial arts, as well as dancing and drumming in the Chinese way. 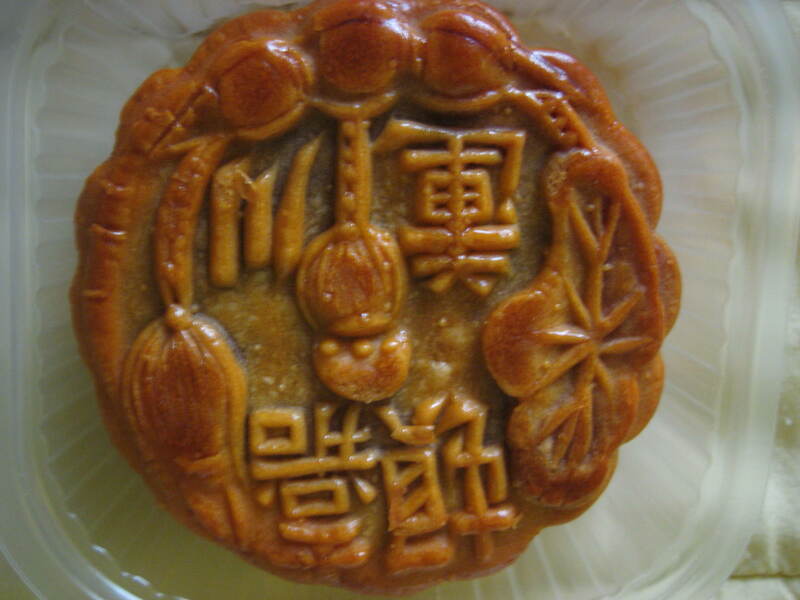 Then I saw something called a mooncake, and just the name alone enticed me. It is a decorative pastry, filled with sweet lotus paste – but the duck egg in the middle was too much for my uncourageous taste buds, and I had to just say no when I got to that part! All in all, I had a delightful time in Seattle, happy to be able to visit this city that is really so close to me. But honestly, when the announcement on the train came, “Next stop, Portland”, I had my bags gathered up and I couldn’t wait for my feet to touch the streets of the city I have come to love the best, my beautiful Portland. Summer is here, and with it comes the talk of summer plans; vacations, adventures, travel to places near and far. My budget these days does not allow for a true vacation, only the trip back to Minnesota in September for my daughter’s wedding, which as lovely as that will be does not count as a vacation. 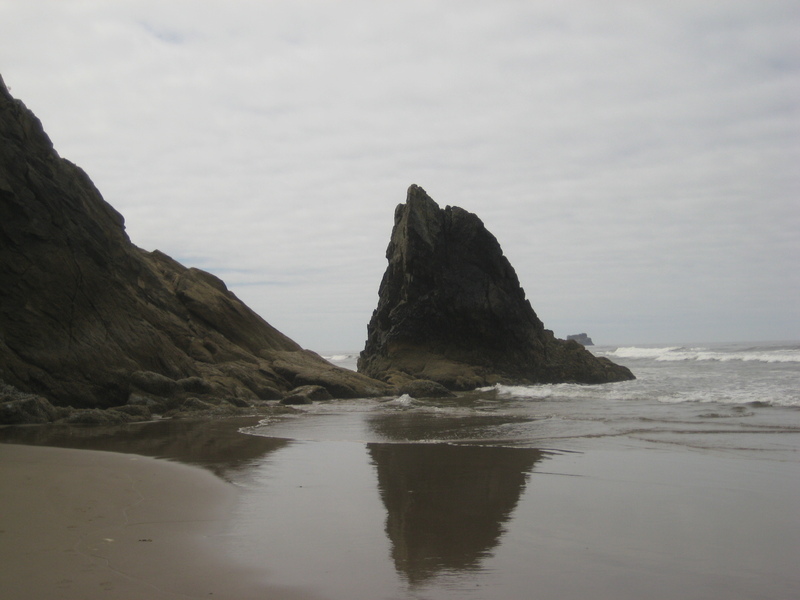 So I have set my sights on a day trip to the Oregon coast. It will involve renting a car, since I sold my car seven months ago and have not been behind the wheel since then. 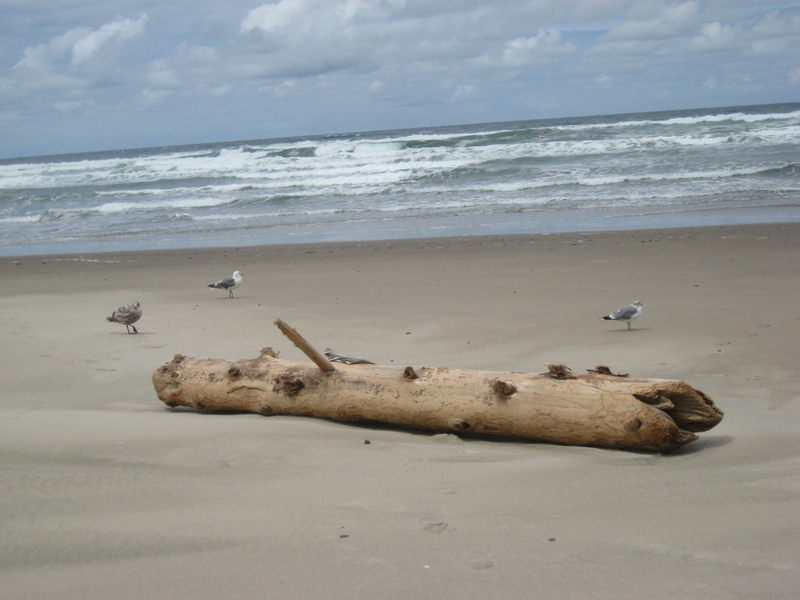 But I’m willing to brave the roads and traffic to experience the ocean once more. 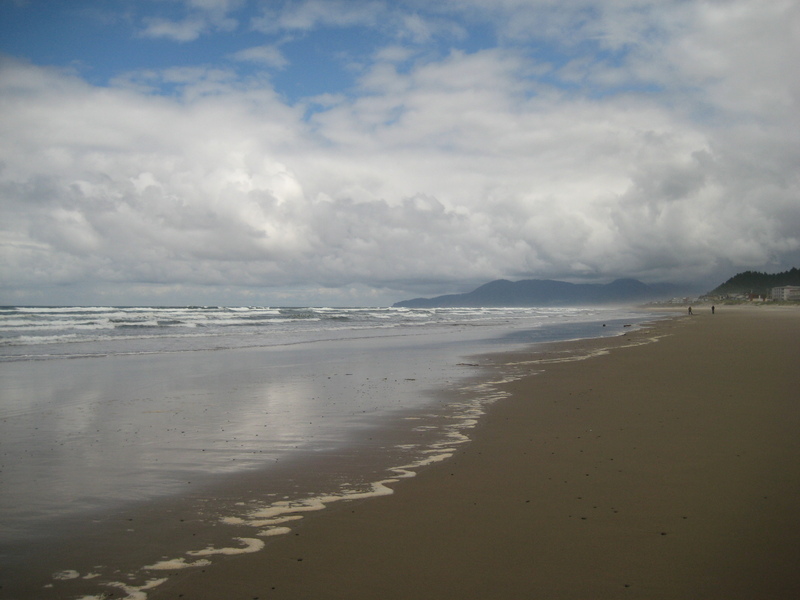 Being only an hour and a half from the Pacific Ocean still takes my breath away. 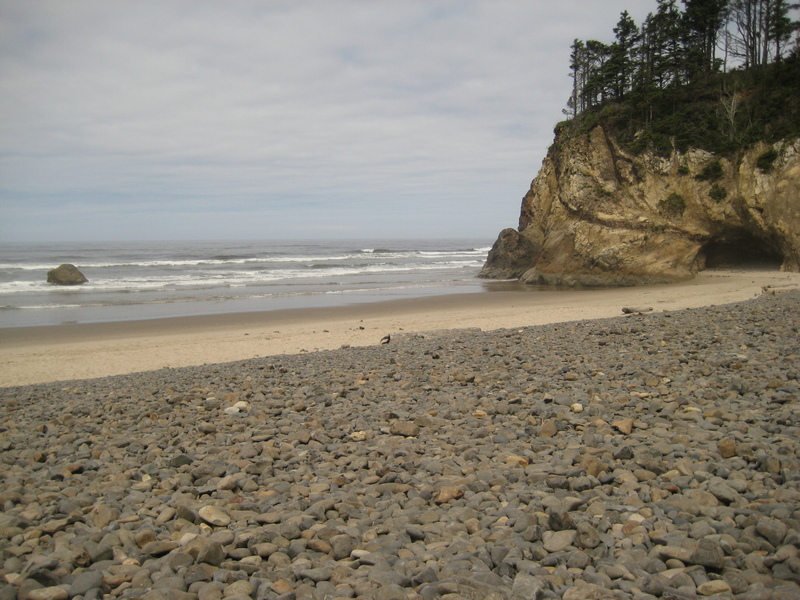 And the Oregon coast is full of massive waves and wind, with a rocky, seaweed cluttered shore that calls to my heart. I had a vision of my ocean before I even saw her, and wrote a poem about what I saw in my heart from miles away in Minnesota. And when I finally came to meet my ocean, she was even lovelier than I could imagine. I had coffee with a friend this morning, and she was relating to me a story about an adventure she had this past weekend with her daughter while they were out of town. The writer in me found it delightful, wanting to capture it and share with others. The sharing is the storyteller that I believe is in all of us, although in our modern era we seem to have given it the back seat of our lives. Our ancestors were wise and perhaps blessed, in not having so many distractions that deterred them from taking the precious time of the telling and retelling of stories; stories that both delight us and help us to find a commonality that we can share in. We had a whole afternoon to kill after checking out of our hotel. I wondered what in the world we could do in this city we had never been to that would keep a young teenage girl entertained, without hearing the strains of, “Mom this is so boring! Oh my God, when will we be able to get on the plane and go home? !” I had wandered around the city one day while Anne was meeting with a group of other prospective college students. To put them at ease the group was led by some student volunteers at the college, not much older than the visitors themselves, gladly herding the masses of those making the rounds of college visits. These hard working volunteers had put together a “students only – no parents allowed” time, designed to allow the group of oftentimes shy teenagers to feel more at ease without mom or dad standing nearby asking possibly embarrassing questions. In my sojourn of the city that day, I found plenty of restaurants, museums, and the sports stadium but to my surprise I couldn’t find anywhere to shop. I asked about this at the front desk of the hotel when Anne and I returned after her campus visit; where was the nearest place to shop? We found out that the mall 10 miles away was the nearest shopping experience, and was easily accessible by taking the number 19 bus. So after checking out by noon on our last day, I asked at the front desk if they might be able to secure our luggage somewhere while we went out for a little adventure before heading home. They graciously found a place behind the desk for our things, and out the door we went to find bus number 19. We searched high and low for the bus stop, when Anne spotted the train stop. “Look Mom, there’s a train just like we have at home. Why don’t we just take that instead?” Oh, the unbridled enthusiasm and lack of fear that the teenager possesses. Well, why not? I thought. We were used to taking public transportation at home, and I figured it couldn’t be that much different than any other city train. So with tickets in hand, we boarded the next train that came our way. We found a place to sit, and I started studying the map of the train route. I thought I had found our stop, so we got off on the 1300 block. But as we started walking, I thought to reach into my pocket to double check the street address of the mall – a thought that had come to me before we left the hotel. In horror I realized that the mall was 4300, not 1300 – we were 30 blocks away! Much too far for us to walk, even if we had to time to do so. But once more my daughter’s keen eyes spotted the ever elusive number 19 bus stop. Finally! Now we could just hop on and ride the 30 blocks, do a little shopping and head back to the hotel in time to catch out airport shuttle. So once more with tickets in hand, we climbed aboard for another ride. After a time though, I started to wonder as we begin to loop our way around the streets, rather than making our way from 1300 to 4300. In all actuality, we seemed to be headed in the opposite direction! My fears were confirmed when I saw the familiar buildings around our hotel; we had just completed a very large circle of the city! All we could do was laugh it off, and pretend that we had really meant to take a tour of the city like any other tourist; and we walked off the bus empty handed of shopping items but full of the excitement and satisfaction of having survived an adventure in a strange city. “It wasn’t my fault we missed the turn!” I shouted as we drove down the seemingly endless country road. “How can you not read a simple road map?” was the reply from the driver’s side of the car. “You call this simple?” I countered, “I need a magnifying glass to figure out which thin line of a road we are actually on.” I stared at my husband’s stubborn face, waiting for a response. “You could have stopped miles back and asked for directions.” Still no response. And I made a mental note – Valentine’s gift this year, a GPS unit.